Bought for my grandson and he is very picky. But he loved this watch. Especially the gun metal color/material. He works in the food service business and can wear it without the worry of it getting a little wet at times. This sturdy Timex watch is crafted of black resin for durability, and features a convenient digital movement. The piece showcases an acrylic crystal and a tang buckle closure. This Timex watch is exactly what it is, a Timex watch. It's fairly rugged (good for young men), and it's got a pretty nice look to it with the gun metal and red trim. It is not jammed full of largely useless features, which is shocking, so you're left with standard watch functions like time-telling, and alarm functions! This one is a can't go wrong for the price. Excellent watch ... easy to set all features .... Large digital numbers ... watch wrist strap is very sturdy ... very pleased with this purchase in terms of cost and operation. Takes a Lickin and keeps on Tickin !! 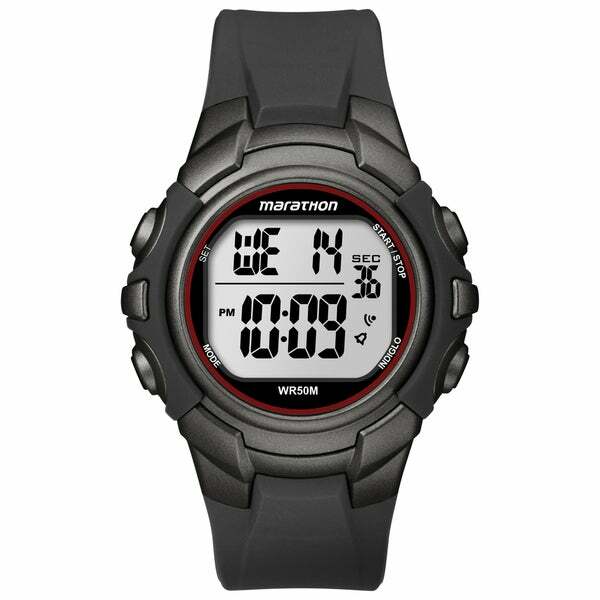 Mostly it just plain works with large figures that are easy tor read... Also waterproof and seems to be just as good as the more expensive digital Timex Ironman models. Bought this for my special needs brother-in-law. We needed something simple, but designed for an adult. This watch did the trick. Buying for an adult special needs person requires a lot of thought and searching for the right item that fits their capabilities, this was the answer for us. Like the watch but it did not come with instructions on setting up the time. I love this watch! I have had it for over 1 year and it is still functioning like it is brand new! Excellent inexpensive time piece. It will take the abuse you can give it and more! The name Timex speaks for itself. My husband love this Watch, he wear it everyday. He has a small wrist, so it works great for him. Love this watch. As the old Timex ads said, "it takes a licking and keeps on ticking".